Ask a New Zealander about my hometown, Dunedin, and she might mention the beautiful setting, the stately old buildings, or the royal albatross colony. One thing she’ll certainly mention: the cold. It’s not really that cold here—we get two or three snowfalls a year, usually gone by midday—it’s just that it’s colder here than most of New Zealand. And if you nudge said New Zealander a bit, she might even confess that it’s not really the cold—it’s the lack of warmth. I’ve never lived in a city where so many middle-class people reside in so many poorly insulated, central-heat-less, damp, drafty, wooden houses. As an American friend once noted, you don’t live in Dunedin, you camp there. He was right. This is the immigrant’s fate: we learn to accept, even embrace, the differences; but we still notice. I take this walk down memory lane as prologue to a visit to a local museum dedicated to people like me. Toitu Otago Settlers Museum is just down the road from Dunedin’s ornate train station, but its focus is on travelers who came here by other means, especially the sea. The museum’s architectural core is an early twentieth-century building that once housed both the Early Settlers Museum and the Art Gallery. It later incorporated the art deco splendour of a former bus station. But a major renovation completed late last year transformed the museum and brought its narrative into the twenty-first century. It also gave the museum a new first name. Toitu, a Maori word connoting a place that preserves treasures, was gifted to the museum by representatives of Ngai Tahu, the region’s indigenous people. 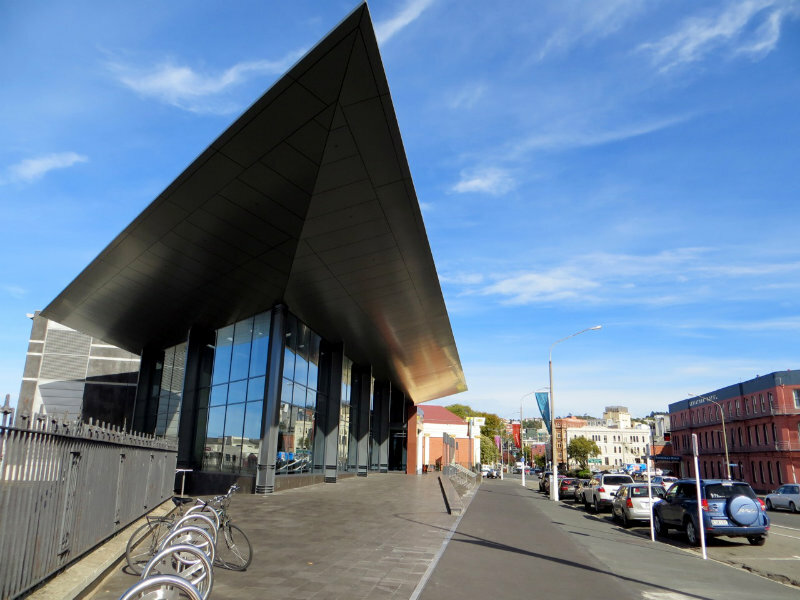 The new entryway resembles a ship’s prow, and indeed the whole of the museum suggests the shape of vessels that brought first Maori then Europeans and Asians to New Zealand’s South Island. Interactive screens throughout the museum allow visitors to hear the experiences of recent immigrants or the family stories of descendants. The museum is laid out chronologically: visitors move through history as they move forward. The first room examines early Maori settlements and shows off the impressive remnants of an older waka, or canoe, and a recently created moki, or reed raft. Later rooms examine everyday life in twentieth and twenty-first-century Dunedin. But the most extensive exhibitions focus on nineteenth-century settlers from Britain. Two standout spaces from the old museum were wisely retained. 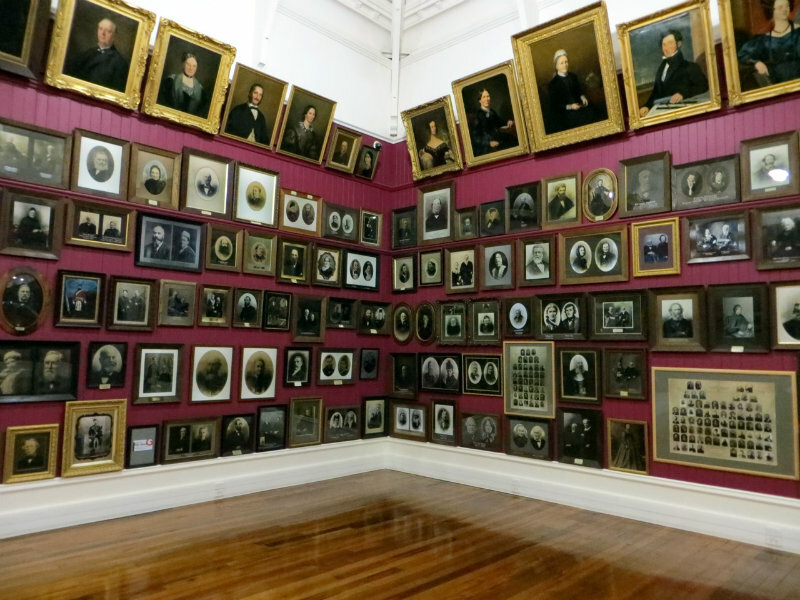 In the large, square Settlers Hall, images of some 600 immigrants from the mid-nineteenth century stare down on visitors in stately or stoic paintings and photographs. These include a few famous figures, like the Scottish Presbyterian minister Thomas Burns, nephew of the poet Robert Burns, who arrived with the earliest European settlers in 1848. Many of these portraits have been on display here for over a century. The subjects are identified by their names, the year of their arrival, and the name of their ship. You suddenly realize how important this last piece of information must have been to building new communities far from home. Imagine a typical nineteenth-century conversation between strangers: “ah, you arrived in ‘58 on the Jura; so did my cousin. Perhaps you know him?” The framed images almost touch each other; the walls behind are hardly visible. But the subjects are mostly solitary or couples, accompanied by the occasional child or blurry dog. Rarely do eyes meet in these images; rarely does the layout suggest extended family trees. But this seems the right metaphor for nineteenth-century migration to New Zealand: here are the disparate individuals, mostly Scottish, who came to start a new life here. They may have been close, but it would take several generations to knit them into families. The second ‘old’ exhibition is quite recent, created less than a decade ago: a claustrophobic recreation of the sleeping quarters on nineteenth-century immigrant ships. The tiny bunk beds are crowded together, leaving little headroom and even less legroom to stretch out in bed. A storage space runs down the middle of the room (baggage allowance was ten cubic feet—imagine migrating to the other side of the world with two carry-on bags). Recorded sounds of feet trudge overhead; plastic rats lurk among the cutlery. It’s extraordinary to think that thousands made the three-month journey, surviving the storms, the vermin, the lack of privacy, the loneliness. People fell in love, gave birth, and died on the journey. Near the physical center of the new museum is a 1860s Cobbs & Co. coach, which once carried miners from Dunedin to the goldfields of central Otago. Their New Zealand moment was brief; they would be overtaken by trains starting in the 1870s. Still, it’s a useful reminder that, while some early migrants came to Dunedin for religious reasons, others came in search of fortune. As in the gold rushes of California and Australia, many came from China—a phenomenon I hope to write about in a future post. Further along, in the twentieth-century exhibits, the focus turns from migration toward domesticity and city concerns. The exhibition of household products, from bottled soft drinks to early home computers, and the varieties of city transport, both public (trams) and private (vintage cars and motorcycles), are fun and memorable, though they threaten to lose the migration theme expressed in the museum’s name. But then again, perhaps these domestic and everyday objects clarify another step in the process of integration. From a purely aesthetic point of view, my favorite spot in the museum is the room dedicated to the Dunedin Sound: a loop of music videos plays favorites from The Chills, The Verlaines, and other bands associated with this southern city. When I moved to Dunedin, I had heard of some of these bands, but not many. But they became part of the soundtrack of my new life. Many visitors watch “Pink Frost” or “Death and the Maiden” and reminisce about the early 80s; I watch them and reminisce about 2005. And a sweet, homey feeling wells up inside me: suddenly I want to bring friends here and share my city’s history and culture. It all makes me wonder: when do we feel at home in a new society? When do we embrace difference? First, there has to be a desire to belong (not easy if you long to be somewhere else), and there has to be a degree of acceptance in that new society (also not easy when you’re discriminated by accent, dress, or skin colour). But if one overcomes these challenges, I think the feeling of home stems from some meaningful event. The first time you confidently give directions to a stranger; the first time you show visitors around your city; the first time you miss it when you return to your previous homeland. The theme of migration returns to Toitu in full force in a corner of the last exhibition room, where a bank of video screens shows a loop of twenty-first-century settlers to Dunedin. Speakers from North and South America, Asia, and other parts of New Zealand comment on their pleasures and frustrations with our little town. It’s a clever, contemporary response to Settlers Hall, but for me it’s one of most unsettling parts of the new museum. Why? Because I’m one of the new settlers speaking. Last year, the video’s director asked me if I’d be interviewed and my story mixed with dozens of other recent settlers. She was intrigued by my Polish/Scots-Irish/American heritage, and she wanted me to talk about my new life in Dunedin. She filmed me for about twenty minutes as I commented on a wide variety of topics. And what did she choose to showcase me speaking about? Dunedin’s fine university? Its remarkable cultural life? Its controversial rugby stadium? Its fab farmers market? Of course not; others do that. I’m complaining about the cold.